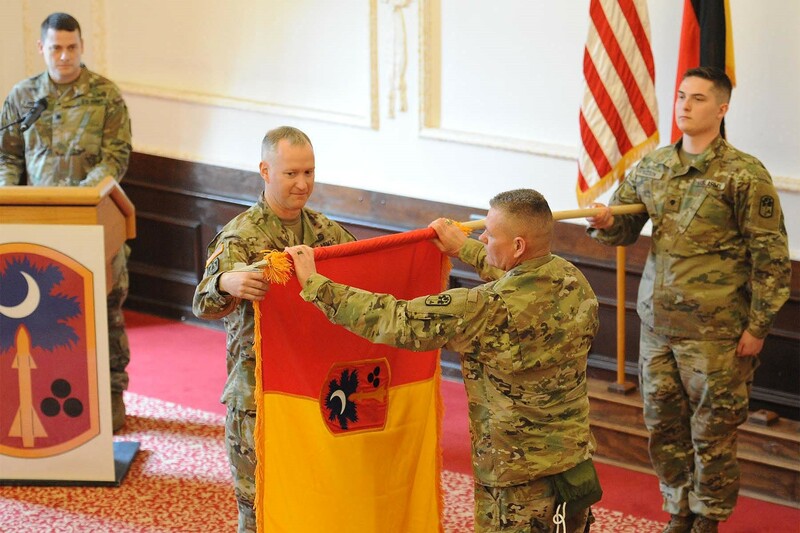 ANSBACH, Germany –Soldiers of the 678th Air Defense Artillery Brigade (678th ADA), officially uncased their colors in a ceremony at the U.S. Army Garrison Ansbach (USAG Ansbach) Von Steuben Community Center on Bismarck Kaserne March 27. During the ceremony U.S. Army Col. Richard A. Wholey, Jr, commander of the 678th Air Defense Brigade (678th ADA), South Carolina National Guard and Command Sgt. Maj. Anthony P. Collins, brigade command sergeant major of the 678th Air Defense Brigade uncased the colors, witnessed by more than 100 Soldiers, Family members as well as German and American community leaders in attendance. The ceremonial uncasing of the colors is a tradition that dates back to the American Civil War when Soldiers would recognize and follow their flags and colors as they deployed in the field. An official ceremony was adopted by the Army in 1921. The March 27 ceremony symbolized the start of the 678th ADA’s forward deployment in Europe in support of U.S. Army Europe’s (USAREUR) Operation Atlantic Resolve and NATO regionally aligned partner forces. On hand to witness the uncasing ceremony were Brig. Gen. Frank M. Rice, Deputy Commander, 263rd Army Air and Missile Defense Command; Col. David Shank, 10th Army Air and Missile Defense Commander, Deputy Chief of Staff, G3, representing the Adjutant General of South Carolina; Col. Christopher Hyman; Col. Kenneth Cole, Commander of the 12th Combat Aviation Brigade and USAG Ansbach Commander Benjamin Jones accompanied by Command Sgt. Maj. Philson Tavernier. German dignitaries 2nd Mayor Rainer Volkert from Bad Winsheim and Bürgermeister (Mayor) Heinrich Förster from the town of Illesheim were also honored guests attending the ceremony. “Today is a historic day for U.S. Army Europe, the 10th AAMDC, USAG Ansbach and the local Ansbach community.” said Wholey, speaking from the lectern to the assembled. “It was less than five months ago we received a notification of sourcing, and thirty-three pre-mobilization training days and twenty post mobilization training days later here we are in Ansbach uncasing the 678th Air Defense Artillery Brigade colors — the first uncased since the cold war drawdown in Europe. Wholey went on to recognize and thank specific individuals and agencies instrumental in aiding the brigade’s arrival and settlement in Ansbach. 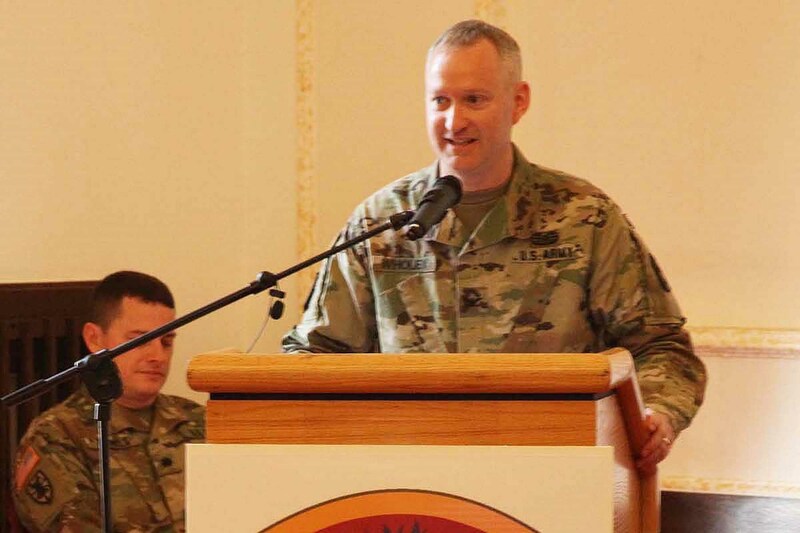 Those recognized included fellow Soldiers and units, family readiness group leaders, spouses and people representing various USAG Ansbach agencies who helped to successfully integrate the Soldiers into the Ansbach and Illesheim communities. Wholey said the smooth transition and arrival of his Brigade was also due to the Soldiers and family members who supported them back home in South Carolina. 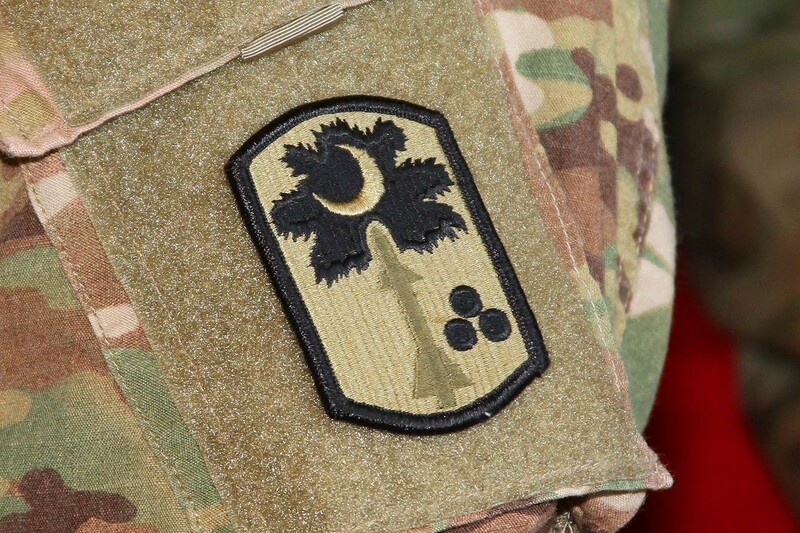 The patch that is worn by and identifies 678th ADA Soldiers bears a stylized missile to represent the type of weapon systems employed by the brigade, three cannon balls to denote the weapons employed in the past, and the palmetto tree branches with the crescent moon, which are associated with the South Carolina state flag, the home of the unit. The 678th Air Defense Artillery (ADA) Brigade is an air defense artillery brigade of the United States Army, South Carolina Army National Guard. Organized in 2014 and headquartered in Eastover, South Carolina, the 678th ADA Brigade is the newest Air Defense Brigade in the U.S. Army. The mission of the 678th ADA is to command and coordinate the operations of subordinate air defense artillery battalions and other assigned and attached units in its operational footprint. The 678th ADA Brigade is the only integrated fires brigade in the Army’s inventory and is the first ADA to return to the European Theater since the end of the Cold War. The 678th ADA is stationed in Germany with the U.S. Army Garrison Ansbach on a nine-month rotation in support of U.S. Army Europe (USAREUR) Operation Atlantic Resolve and will participate in joint and multinational training exercises throughout Europe with NATO Allies and partners. USAREUR forces serve a critical role in advancing U.S. interests and provide a visible symbol of the U.S. commitment to the European regional allies. The U.S. Army Garrison Ansbach (USAG Ansbach) Military Community is located in the Franconian region of Bavaria and is spread across six sites and nine kasernes dispersed around the city of Ansbach and the village of Illesheim: Barton Barracks, Bismarck Kaserne, Bleidorn Kaserne, Franken Kaserne, Katterbach Kaserne, Oberdachstetten Training Area, Shipton Kaserne, Storck Barracks, and Urlas Kaserne. Today, Ansbach is the home of the 12th Combat Aviation Brigade (12th CAB), the community’s largest tenant unit. The garrison takes pride in its support to more than 6,000 Soldiers, civilians, and family members, working and living within the USAG Ansbach area.